Yeah, you’re going to see a lot of Star Wars on here in the coming weeks, what with Episode VIII coming out (very) soon, and Disney pumping out the licensed products like clockwork. Anyway, Bandai Japan is releasing a meticulously-detailed 1/72 scale model of the Millennium Falcon under their ‘Perfect Grade’ series, which is their line of meticulously-detailed plastic model kits. Made of ABS plastic, the kit is based on “thorough research of the 67-inch studio model used in [A New Hope]”. That translates to photo-etched parts, water-transfer decals, and an LED unit which illuminates the engines, landing gear, cockpit, and boarding ramp. It also includes seated Han, Luke, Leia, Chewbacca, Obi-Wan, and C-3PO figurines. The best part? No glue required! The price? Four Benjamins, but this is a hobby-grade, highly-detailed model, so that price isn’t unexpected. This entry was posted on Sunday, December 10th, 2017 at 04:06	and is filed under Toys. You can follow any responses to this entry through the RSS 2.0 feed. Both comments and pings are currently closed. 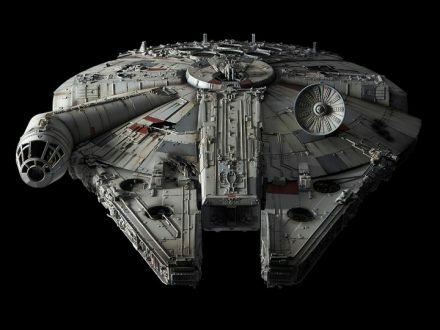 FYI: 2nd paragraph Millennium Falcon is spelled “Mellinnium”. Just FYI.